- The pleas of 17-year-old Zach Tate of Highlandtown to his ex-girlfriend Jaqelynn on November 4 were not part of the Discovery Channel’s regularly scheduled programming. As Jaqelynn said in her retort the following day (once again, not part of regular programming), Ashlyee told her that Nhancy overheard Kellee saying that in 7th grade, you told Derek that Jaqelynn was a fattie. Jerk. - Due to an electrical disturbance resulting from last week’s thunderstorms, a microwave oven turned into a powerful camera and transmitter through fiber optic cable. As a result, a portion of The Good Wife was interrupted by a woman preparing a roast chicken. Charm City Cable in no way endorses her lazy and uninspired seasoning strategy. Lower sodium recipes are one thing, but what she did was just lazy. Lazy like taking a porcelain bathroom fixture, turning on its side, signing it and calling it art. ** If you are married, Glenda Bernard of Glen Burnie, you are not a Good Wife. If not, you’re just hurting yourself. And you have something stuck in your teeth. - The fuzzy stuffed animal that appeared at 11:10 p.m. last night was not part of the evening news. We are told that it was a narwhal, not a mechanized robo-hybrid dolphin and power drill or a manatee in a haute couture dunce cap. As for all that talk about unseen enemies and lasers and teens, we are as confused as you. We would have acted sooner to fix the signal, but some of our technicians thought it might be a preview for the much-anticipated puppet-based reboot of Caprica. - Please note that the strange man with the blackboard who appears on Fox News in the afternoon and calls everyone Nazis is not part of the security breach. Believe it or not, he has his own show. If you have any questions, please call me between the hours of 10 and 1:30 at 410-555-3944. * Nice work, Mary. Way to stay on the ball. ** I have been informed that somebody did that like a century ago. I don’t know whether to apologize or punch a collector of modern art. This comic makes my day happy, because it is fun and adorable. I totally will sign up to make pie for the Victory Party. I am a god of pie making! Now I’m going to have to come up with pies for all my Squishables… I wonder if my Leopard would like a cranberry pecan fudge pie. I find it hard to fit more than two bags of pecans in the toaster. Interesting beginning. I look forward to more episodes. Glen Burnie truly is the worst place that ever existed. I would concur, but I fear that you have not ventured a bit further north up that Olde Route Number Two. Friend, before you hit Bawlmer, you’ve got to pass through Brooklyn. I’ve heard that George Lucas was thinking to use Brooklyn as a back-up set for Mos Eisley in Star Wars but he was afraid of being stabbed during production. *snicker* I love the reference to that dumb cell phone ad from a few years back. Also, I’ve been loving the little extras you write up to compliment the story. The article about the Fighting Pandas, the amazon.com review for postal boxes, today’s one…they’re all glorious! i’m sure its my age showing…but what in the world does IDK mean? It means “I don’t know.” its interwebs short form, just like ROFLMFAO! love this comic. So far so good I can’t wait to see what’s next. 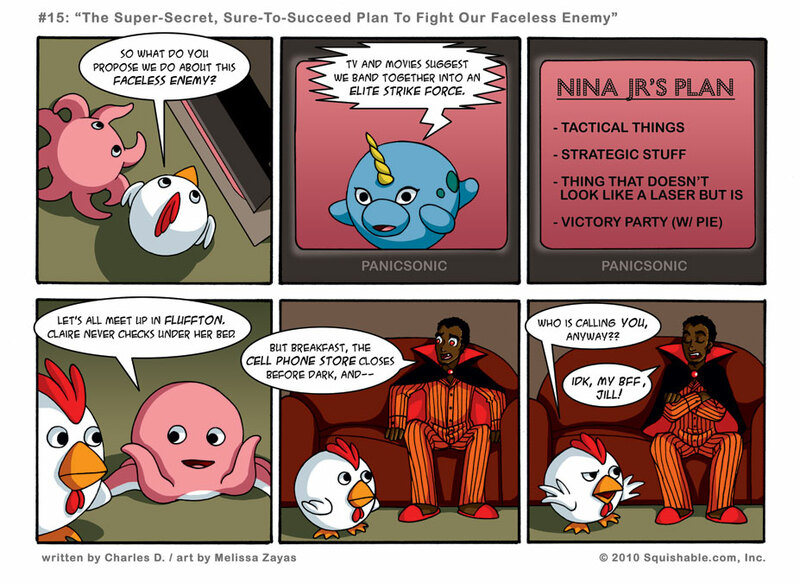 That is a good battle plan, Ninja Jr. I wouldn’t take much convincing. As far as I’m concerned, a urinal turned sideways sums up modern art pretty well. Thanks to Menage a 3, I stumbled onto this comic. I love it! all of the best victory parties are w/ pie! I guess Charles knew about it? Why would you look up IDK? Doesn’t EVERYONE know what it means, unless you’re like 90? ahah!”IDK MY BFF JILL!” I remember that commercial!!! x) Ha.